A Literary Odyssey: Blogversary Giveaway #1. 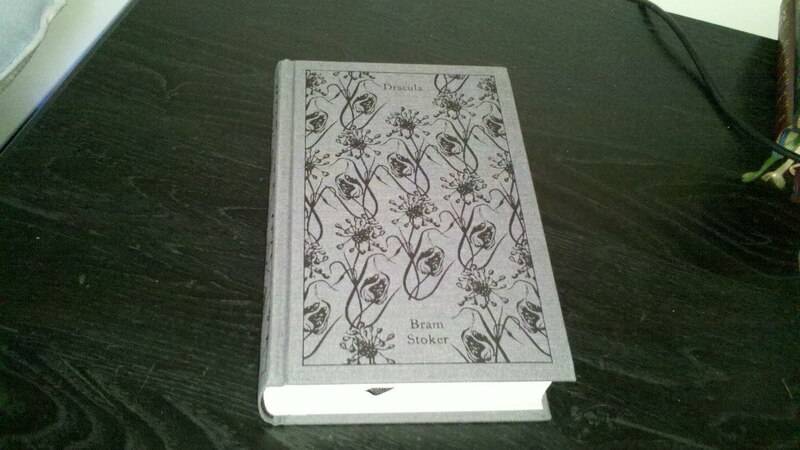 Above is a Penguin Clothbound copy of Bram Stoker's Dracula (and my dirty desk. I need to dust). I have the full set of clothbounds and I absolutely adore them. Any opportunity I have to give one away, well, I jump all over it. I am especially pleased to give this one away, since I will be reading it in September/October, and I hope the lucky winner will read along with me. The giveaway ENDS Tuesday, August 30th at 11:59 EST. You must leave your e-mail in your comment so I can contact you if you win. In your comment/entry below, answer the following question: What is the scariest thing you have ever seen or done? happy blogeversary.Twitter follower lomazowr@gmail.com Enter my name thanks!! I would love a chance to win - been needing to read Dracula! What fun! :D I lurve Dracula, it's a book I find improves on rereading, and I lurve the Penguin clothbounds (jealous of your set! I only have Emma, which I won in a giveaway on Literary Transgressions). I would love to reread Dracula in the Penguin edition. I went to Knott's Scary Farm (that's what they call it at Halloween) once, which I thought would be really cheesy, but it turns out that I am really scared of live action haunted houses. I haven't been able to go in one since. Happy blogoversary! The scariest thing I've ever done I actually haven't done yet. On Tuesday I have to give my first shot and I am terrified! I guess the scariest thing I've done so far that is related to that is my first needlestick last summer - I drew blood from my husband and it was traumatic! Happy blogoversary, two years is a wonderful achievement and you should be very proud. I love your blog congrats on your blogiversary! No need to enter me, but I wanted to say cheers to your blogversary. I don't think I need to reiterate how much I adore the Penguin books and I don't have Dracula. I review theatre in Indianapolis for another blog and I'm seeing Dracula next week! The scariest thing I think I've ever done was traveling to Europe for the first time... by myself. I loved every second of it and have traveled there half a dozen times since then with friends. But the very first time I went I was 19 and I flew by myself to a foreign country. I am so glad that I did, but it was scary for a second. No need to enter me either, but I wanted to say Happy Blogaversery! Congratulations on the anniversary! More, onward, etc. I love the idea that you have to screen out the 12 year olds who want this book. Yay! Fantastic project and brava to you for continuing it. I can't believe I don't have a single one of these beautiful cloth-bound books. The scariest thing in my life was probably when I choked on a peppermint. I was probably around 10 years old and didn't know the sign for choking so my parents originally thought I was going to throw up... it was terrifying until I managed to cough it up. The scariest thing that happened to me isn't very pleasant, to be honest. I woke up one morning last semester to a girl screaming/crying in the hallway of my apartment building. After a while, I went to see what was wrong, and she told me she woke up and her friend she was staying with for the night was dead; she asked me to go see if she was seeing things out of hysteria. She wasn't. You don't really want to know more than that. We've all recovered, but it was definitely a terrifying experience. The scariest thing that's ever happened to me is when I almost drowned in my grandparents pool when I was seven years old. Thankfully, my older sister jumped in and saved me. Happy blogoversary! And I'm dying to know, do you have the clothbound Madam Bovary? It's beautiful and apparently out of print already, I've seen them on ebay for horrific prices. I've had a few scary experiences, probably one of the scariest was riding the Chicago el with a friend at about 3 a.m. In a crisis, he would not have been much defense. It was a really bad idea to stay out that late. Happy bloggiversary!!!! You don't have to put me in the drawing because I already have a copy, but it is a beauty! The scariest thing I've seen was being at work and watching the Twin Towers burning. I wasn't in Manhattan, but my job had a clear view across to lower Manhattan. As for the the scariest thing I've done,I went under anesthesia for a procedure for the first time last year. I fretted about it for weeks and felt silly after it was all over. No need to enter me...just wanted to wish you a happy blogiversary! Well, since I JUST finished dealing with Hurricane Irene, I would have to say driving down the road yesterday when a tree came down on the car just in front of us was pretty scary. (That and the flooding, power outages, people losing their homes...) As a person who lives in the north east, we never get it this bad. Now we're just left picking up the pieces. Well, just to make your husband happy, I'll enter to win ;-). I feel like such a sissy because I haven't done much scary stuff. I don't even watch shows like ER or Bones because I'm such a baby. I was pretty freaked out once on the Haunted Mansion ride at Disneyland when they had a real person dressed up as a knight and sneaking up on people. I had been on the ride many times and it had never happened before, and it has never happened since. If I didn't have friends with me at the time, I would think I imagined the whole thing! Hope that silly story counts! Happy Blogversary! Camping out on mattresses in our downstairs hallway this past weekend to wait out the hurricane and potential tornado was pretty scary. Thanks for the giveaway. Hmmm...recently the scariest thing I saw was the scene of the accident where my husband rolled his truck over a bank. He escaped with no injuries, thank god, from a situation that could have been deadly. On a lighter note, Happy Blog Anniversary! Wow, I'll have to check out these clothbounds; they're GORGEOUS. *judging how much space a set would take* Happy blogoversary, and here's to another great year of blogging insanity! Scariest thing: I get scared at the smallest things. So possibly me watching the first 5 minutes of The Ring before shutting it off. Or my dad forcing the 8-year old me to go on a big water slide when I couldn't swim (the lifeguard saved me). Or going on my first huge rollercoaster ride. The list is endless. Those clothbound editions are gorgeous!! The scariest thing that I've ever seen was a child almost getting hit by a car. I was in the car behind and a little boy ran out into the road chasing a ball. My heart skipped a beat, but thankfully the driver was able to swerve. Everyone was shaken but no one was hurt.